Yamaha revisits classic design with €15,000 NS-5000 speakers | What Hi-Fi? Yamaha is giving the heavyweight NS-5000 speakers their European debut at IFA 2016, and confirmed the new take on a classic pair of Yamaha speakers will go on sale in Europe and the UK. 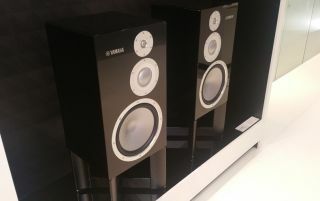 Yamaha has a new pair of flagship floorstanding speakers on the way in the shape of the NS-5000. The speakers are a modern, extremely glossy take on the classic Yamaha NS-1000 speakers, which launched back in the 1970s. Set to go on sale in Europe for €15,000, and closer to £14,000 in the UK, the NS-5000 speakers have a 3-way design and are use a new driver material called Zylon. Replacing the beryllium used in the original Yamaha speaker diaphragms, Zylon is a polymer that's also used by NASA and in F1 cars, and is known for its strength and light weight. The speakers also boast an "innovative cabinet construction" that promises no parallel walls. The speakers come with optional stands and thanks to a Yamaha piano gloss black finish, they strike a smart if somewhat imposing appearance. Further details are thin on the ground for now but if you're in the market for a high-end speaker, it looks like Yamaha could be back on the shortlist.